The Adirondack Park is a very unique parcel of land, and has been for hundreds of years. The Adirondacks are the only mountains in the eastern United States that are not geographically Appalachian. In the late 19th century, it was known as the most prestigious resort area in the country. In the 1900s, the Adirondacks became the only area in the western hemisphere to host two Winter Olympic Games. The Adirondack Park is the only wild lands preserve in the U.S whose fate is decided by the voters of NY, the state which it resides in. Most of the Forest Preserve lands in the Adirondacks are classified as either Wilderness, Primitive, or Wild Forest. The largest and most remote segments are classified as Wilderness. Wilderness Areas include: Dix Mountain, Giant Mountain, High Peaks, Jay Mountain, McKenzie Mountain, and Sentinel Range. Motorized vehicles are not permitted, and structures are limited to lean-tos. Primitive areas are similar, however these include structures such as roads, firetowers and private inholdings. Primitive Areas include: Ampersand, Hurricane Mountain, and Johns Brook. Wild Forest areas are smaller, but see more traffic as motorized vehicles and snowmobiles are permitted on designated trails. 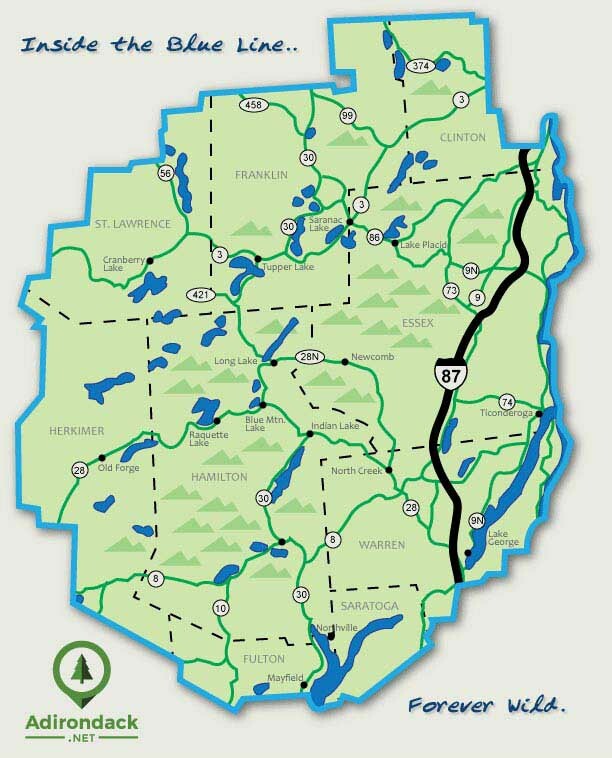 Wild Forest Areas include: Hammond Pond, Saranac Lakes, Taylor Pond, and Wilmington. With 6 million acres of Wilderness, Primitive, and Wild Forest Areas, there is virtually no limit on the enjoyment that can be found here. Hiking, Biking, Whitewater Rafting, Paddling, Fishing & Hunting, Skiing and Snowboarding are just a few of the favorites across the area, with many more activities available! The 6-million-acre Adirondack Park was established by the New York State Legislature in 1892, and has evolved in to a patchwork of public and private lands, where thousands of people live, work and play in a protected environment of mountains, forests and streams. The private lands are primarily part of the the Adirondack Forest Preserve, a diverse system of State Lands created in 1885 by an act of the New York State Legislature as a conservation effort to stem widespread tree cutting that supported the many lumber, paper, leather tanning, and iron mining industries that predominated the 19th century landscape, as well as ensure the major transportation corridors of the day - the Hudson River and Erie Canal - would not suffer reduced flows from continued logging. This was one of the earliest acts of public land preservation in the nation. Now that you have visited the website, visit the Adirondacks!